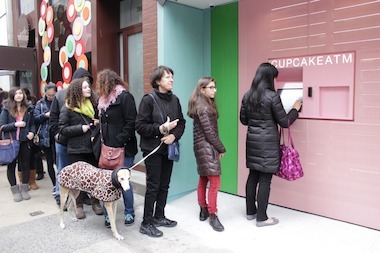 UPPER EAST SIDE — For New Yorkers, cupcakes are now just an ATM swipe away. Sprinkles bakery's 24-hour Cupcake ATM opened on Tuesday at its Lexington Avenue store to the delight of treat-seeking city dwellers and tourists alike. Not even the freezing temperatures could deter people from trying the device on its first day in operation. A line of people consistently 12 to 15 deep waited in the cold for their chance to punch their order onto a touchscreen and have a robotic arm fetch their cupcake of choice. The cold weather didn't deter New Yorkers from trying out the device. A Sprinkles employee said that the line formed even before the shop opened at 9 a.m.
Mary Ann, 65, stopped by Sprinkles in the morning before the machine was up and running two buy two cupcakes, but came back in the afternoon to try out the ATM. She said she makes frequent trips to New York City from North Carolina to look after her friend’s dog. “I can look forward to this every time I come back now,” said Mary Ann, who declined to give her last name. The machine is stocked every few hours with Sprinkle’s cupcake flavors of the day and can serve up to four cupcakes at once, according to the company. Lee said the real appeal of the ATM was that it offered the chance to eat cupcakes anytime. 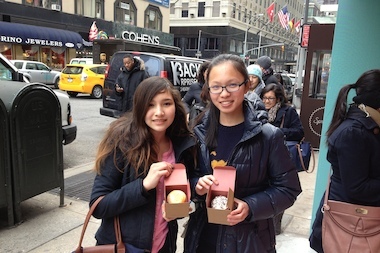 “I think it’s really great that it’s 24 hours," she said, "and I can come here whenever to get a cupcake.” she said.